Welcome to the LiteMage Showcase! This is a series of blog posts where we take a look at Magento site owners using LiteSpeed Web Server + LiteMage Cache and highlight how LiteMage has uniquely benefited them. This week we are featuring Sustainable Furniture, a business based in Cornwall England specializing in ethically and sustainably sourced furniture and accessories. Sustainable Furniture’s site has around 1,500 products with variations across 40 categories. They receive around 35,000 unique visitors/month and 100,000 page views/month. To accommodate this, Sustainable Furniture had tried everything to optimize their site. They were using Lesti_FPC to lower their server load — which made a big difference. They had also tried to implement Varnish Cache but had to give up due to complications during setup. They also made use of CloudFlare’s Pro subscription to help keep the site secure while also offloading some of the burden on their server. CloudFlare caches and compresses the site even further before it reaches the customer. Despite all of this, Sustainable Furniture would often have server load issues, forcing the server to stop serving pages in order to catch up to the high demand, costing them sales and customers. 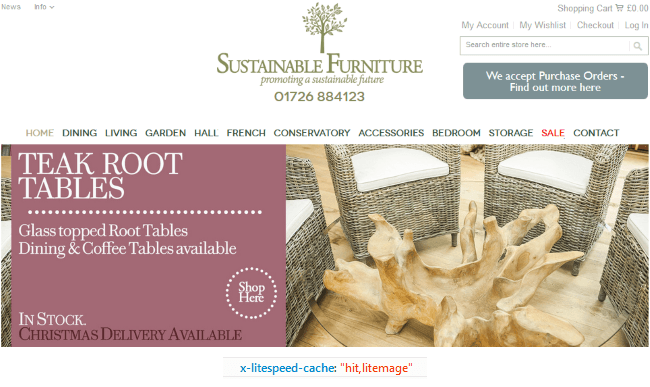 Sustainable Furniture implemented LiteMage Cache with default settings and immediately saw their page load times drop to at least half of what they were previously; often the improvement was much greater than that. They no longer experience load issues or dead patches and find the site is generally quicker and more responsive. Interested in LiteMage Cache? Click here to find out more or visit our Magento Connect page to try LiteMage for yourself! Can Your Magento Do This?